Jim and Patty’s home is the meeting place for both the men’s and women’s groups in the neighborhood. 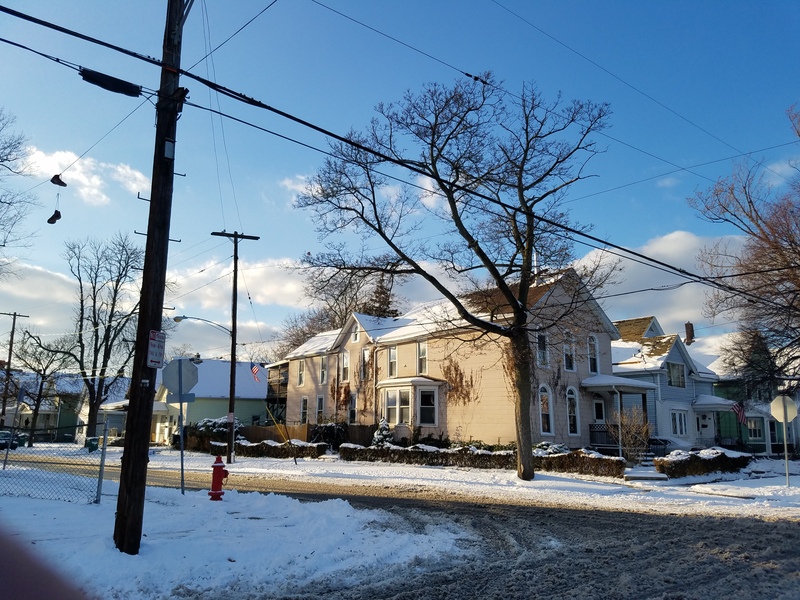 The Black Rock neighborhood of Buffalo sits on a bluff overlooking the Niagara River. It’s an area of once stately homes where neighbors can recall children playing outside safely until the street lights went off. Today, there are gangs and drugs and low-cost housing that attracts immigrants from all over the world. It’s not uncommon to meet neighbors from Myanmar, Eritrea and Afghanistan along with the long-time residents who raised children in the area. Four years ago, after prayer and discernment, the Buffalo branch decided to start a prayer meeting in Black Rock. “Initially, we did a fair amount of advertising in the local newspaper and church bulletins and by flyers and word of mouth,” explains Bud Northway, who leads the branch’s outreach efforts. Branch members walked the streets, visited a local soup kitchen and hung flyers, praying with strangers and talking to anyone they could. They forged a connection with Fr. Richard Jedrzejewski, the pastor of Church of the Assumption, a local Catholic parish, who was eager to host the meeting in his church. 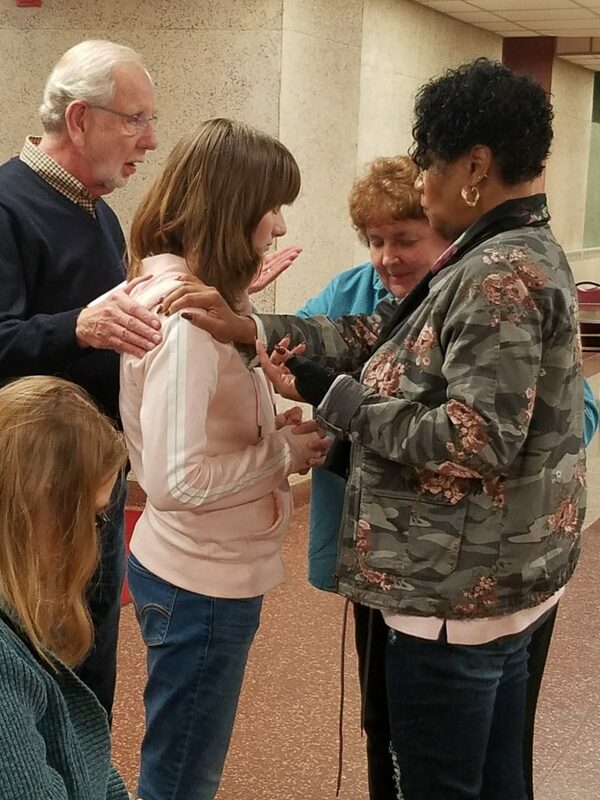 Bud Northway and Martha Delaney (in blue) join a prayer group member in praying with another prayer group member at the Life in the Spirit Seminar held in Black Rock this past November. George recalls a funny moment when he and Bud wanted to introduce the practice of birthday honorings to the Black Rock men’s group. “We probably spent 45 minutes trying to explain what we were proposing,” he recalls. “I don’t think the men really understood what we were trying to do because they thought we were just going to be saying all this flowery stuff. They felt they might be a little embarrassed. So Bud and I looked at each other and we just launched into doing it. As we finished up the honoring, the other men were like, ‘So that’s what you meant! Wow. That was pretty cool.’” Honorings have been a tradition in the group ever since. 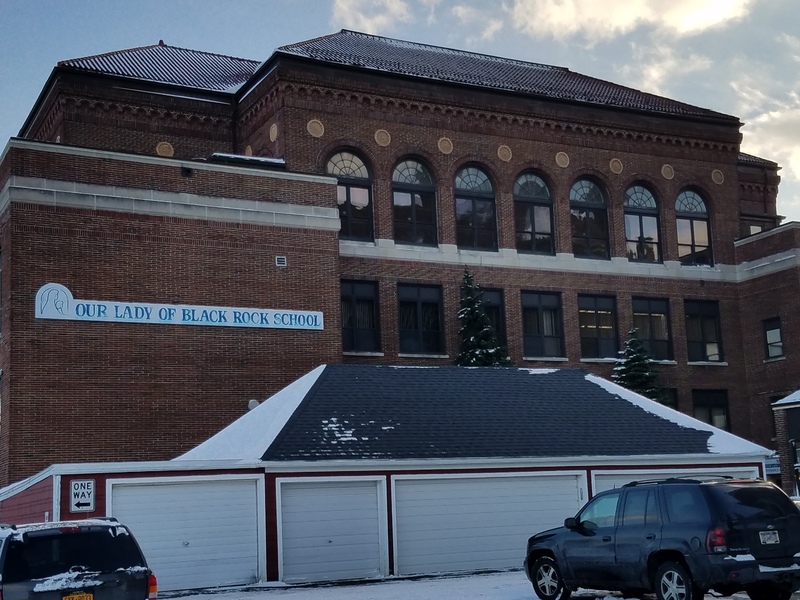 The last few summers, the branch paid the costs for children from the Black Rock neighborhood to attend their annual Buffalo Camp. Seven children came to camp in 2017, and afterward they brought their families to an event the branch hosted in Black Rock, trading stories and introducing their parents to branch members. 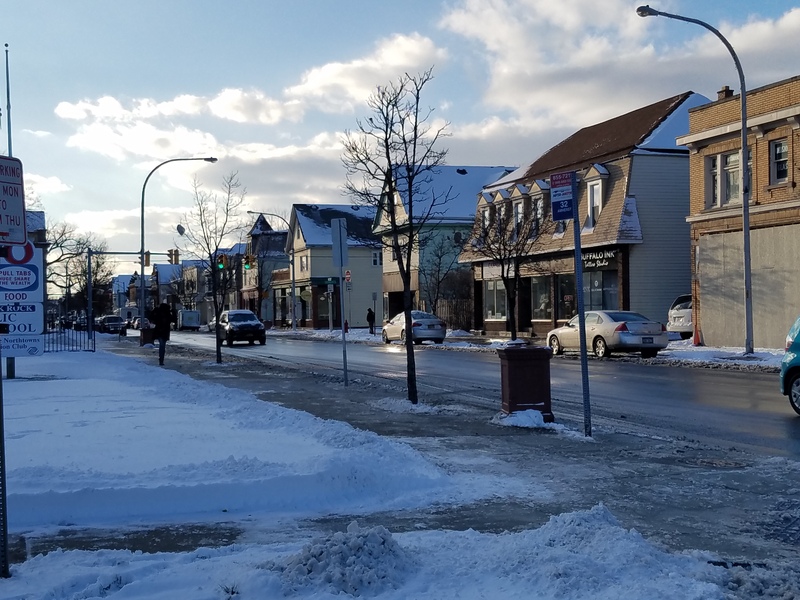 Winter in the Black Rock neighborhood of Buffalo. When Bill, an attendee of the prayer meeting and a member of the Black Rock men’s group, first brought his daughter Tina to the prayer meeting, she had been addicted to cocaine for more than 15 years. One night in 1994, Tina, a young hairdresser and dance instructor, was in a car with some friends when the driver turned up the music, floored the gas pedal, and took the car off the road to kill herself. Tina survived, but severe injuries to her leg caused a near amputation and three subsequent knee surgeries. Three years after the accident, she was unable to dance or hold a hairdressing job due to her injuries. Tina was just coming off the prescription painkillers she’d been given for her leg when she went to a party where she saw a friend sniffing cocaine. “It gave me this extra energy. It filled in a gap. And that was the first time I did any type of hard drug,” she recalls. Throughout her twenties, Tina struggled with cocaine addiction. She moved back and forth across the country, but would periodically return to live in Buffalo. She shed 35 pounds and looked thin, pale and sickly. Aware that her life needed to change, she spent the next several years in and out of various types of drug rehab programs, but often she would come back to Black Rock, see her former acquaintances and dealers and fall back into drug abuse. 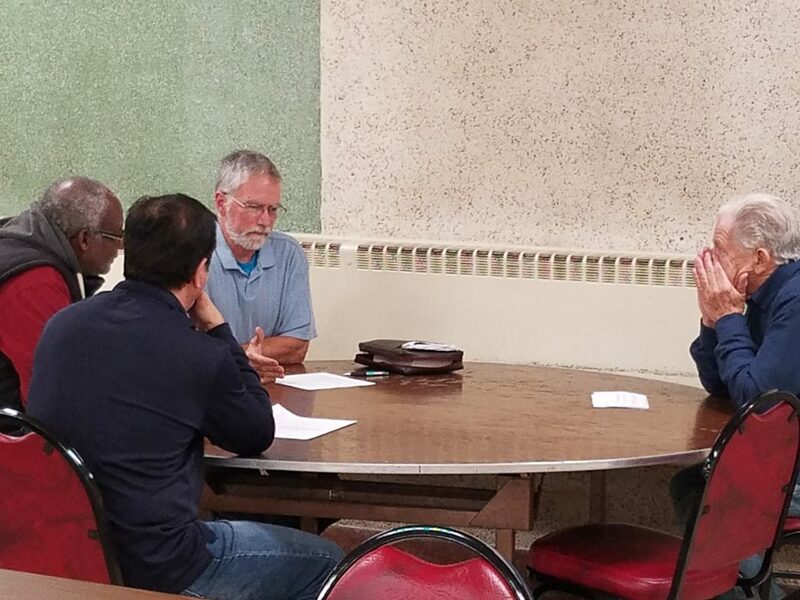 Tim Hammer (middle) leads a discussion group at the Life in the Spirit Seminar. She said a turning point came in 2014, when she went on the Buffalo branch’s women’s retreat. When she arrived, she hadn’t slept for three days due to her cocaine use. “I felt really great being in this holy spot,” she recalls, before adding, “I was nervous. I was shaky. 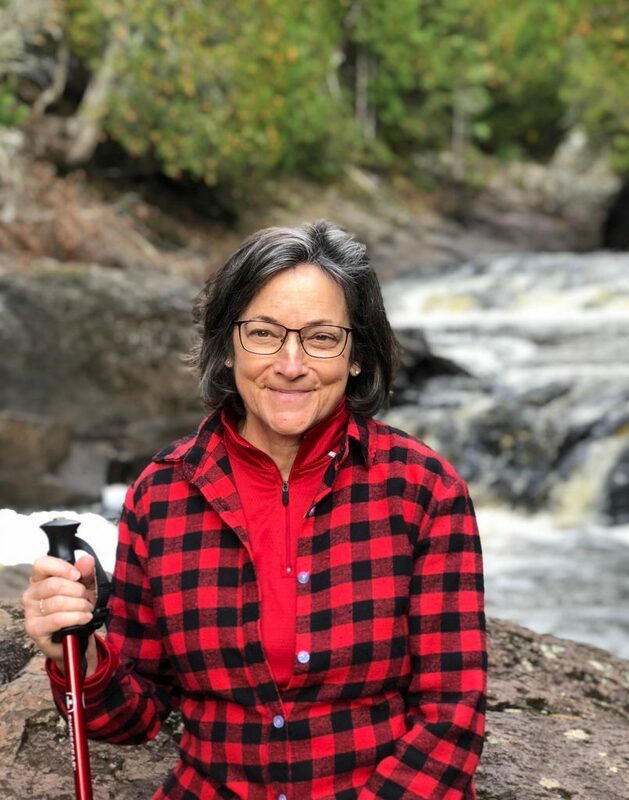 You couldn’t tell that I was shaking but my veins were shaking inside me.” Tina hit it off with Arlene Meyerhofer, who took her to the kitchen and fed her strawberries and chocolate. Tina says, “I always stayed in touch with Arlene when I was on my journeys, and I would talk with her so much. And I would talk to Bud often. Tina’s been clean for over a year now, her longest period of freedom since she first tried cocaine. She’s found new purpose in selling skin care products online. Sayed first met the People of Praise in the person of Bruce Wansart while drinking coffee in a Wegmans grocery store in Black Rock on a Thursday afternoon. Earlier that same week, Sayed, a young man, had arrived with his family as a new immigrant to the United States from Afghanistan, after waiting for years in Pakistan and Kyrgyzstan as a refugee. Bruce had stopped in the store on the way to the Thursday night prayer meeting, and he invited Sayed to come. Over the next few years, John befriended Sayed and his parents and siblings, driving 45 minutes from his home to visit them two or three times a week. Their house had a view of the twin church steeples Sayed spoke about from his dream. John noticed that they had very little furniture, so he found them a few things, including a couch and a table. When it started to get cold in the fall, John took the whole family out to the store for winter coats, hats and gloves. Sayed’s family moved to the West Coast in 2016 to live near his sister’s new husband, but John has kept in touch. John arranged for him to stay with the Brotherhood in Portland for a week when Sayed was looking for work, and also put Sayed up in Buffalo when he considered moving back. They continue to keep in touch. Men praying for one another during the Life in the Spirit Seminar. 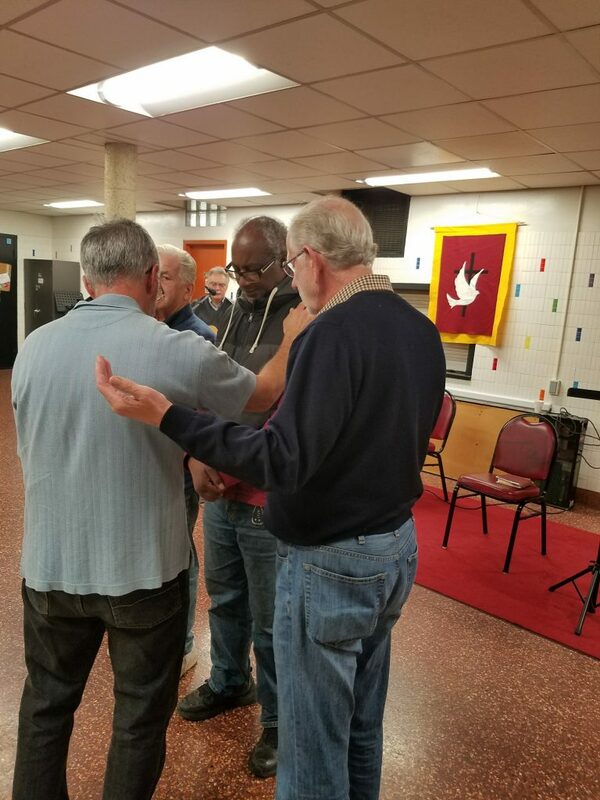 This fall, the Buffalo outreach team put the Thursday night prayer meetings on hold so they could run a six-week Life in the Spirit Seminar for the regulars. On the final night of the seminar, they prayed with 14 people to be baptized in the Holy Spirit. The following week, some of those prayed over shared their stories. A young man who lives in a group home received the gift of tongues that night. He shared that he now feels comfortable going out and walking around the Black Rock neighborhood. “You may think this is just a small thing, but it’s really big for me,” he explained. Another young woman from the group home spoke of the “best day of my life”—the day she was prayed with. (“Most of us, when we heard her say that, our eyes just welled up,” Bud recalls.) One man shared that he had a joy-filled week with a renewed energy to do things. And one woman stood up and said, “I am a recovering alcoholic.” She’d been in recovery for six and half years, but was still tormented by nightly dreams about drinking. The whole week after she was prayed with, she said that she hadn’t dreamt about alcohol once. This is so wonderful. There are still organizations that really want to help people. Thank the Lord for them and I pray he continues to bless them all. Also to those in need, God bless you for turning your lives around and giving over to God. My goodness, reading this story again I am so moved by my love for brothers and sisters in our branch. This Black Rock work is a work of the Holy Spirt, it is labor of love, it can look like a very humble effort on any given week, but we know that the Lord says to judge a tree by the fruit it bears! Thanks to all you willing servants, my dear brothers and sisters in Christ.